We help you send emails to real email addresses so you get real results. Fewer bouncebacks and higher value contacts mean a bigger ROI and a squeaky clean digital reputation. Upload your email list and sift out duplicates and all the junk. 1 verified email = 1 credit. No monthly charges, volume discounts, unlimited credit purchasing power, and credits that never expire give you complete control. Get 200 credits for free on sign up! Integrates with the most popular services like Google Sheets, Salesforce, Mailchimp or Campaign Monitor. 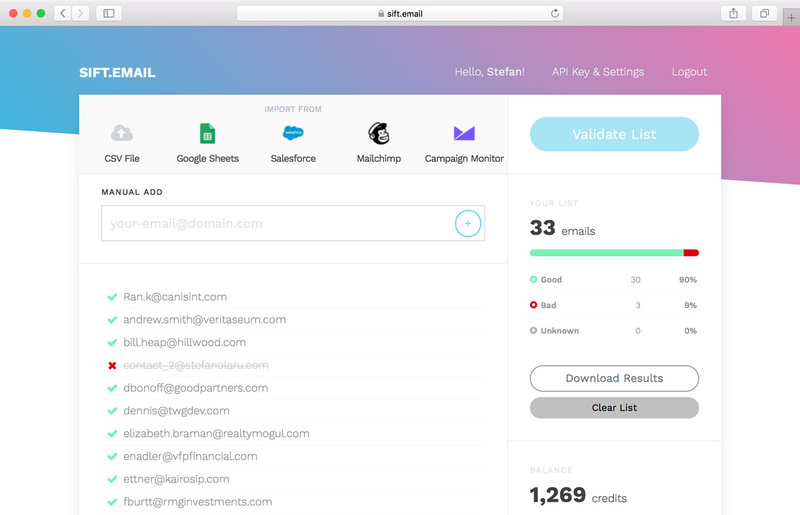 You can pull your email list and validate it with just a few clicks. Yeah, it's that easy! Validate email inputs on the fly, prevent the "asdasf@dsada.com" submits, ignore the disposable accounts, drop the dreaded CAPTCHA. Thousands of use cases, just a few lines of code. Get up and running with sift.email API in just a couple of minutes. We're not in the business of collecting your data. Email addresses submitted for validation to our service via website or API are neither stored nor collected in any manner. Need help or wanna get in touch? 200 credits for free on sign up!